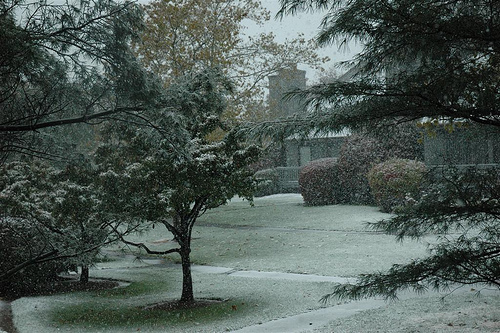 It’s not even November yet, but we already have our first snow of the season! I don’t remember when we had the first snow last, but sure not this early. I am staying at home today with the kids to help them recover from the heavy jet lag. It’s so cold both outside and inside the house that I have to turn on the heat to keep them warm. Speaking of turning on the heat, we had our first oil delivery since March yesterday. At this time last year, when we received the first delivery of the season, I was pleasantly surprised to see that we used only 27 gallons of heating oil in 5 months. This time, the total amount is much higher, 120 gallons, but it was consumed in more than 7 months! Last year, the price we paid was $2.459/gallon, now it’s $2.969 per gallon. That’s an increase of 20.7% in one year. If the crude oil price didn’t below the $70 mark (a nearly 50% decline since its peak in early July) recently, the price we pay could be much higher and the winter could be a tough one. Fortunately, it looks like we are not going to see $150 a barrel oil any time soon with the economy struggling.